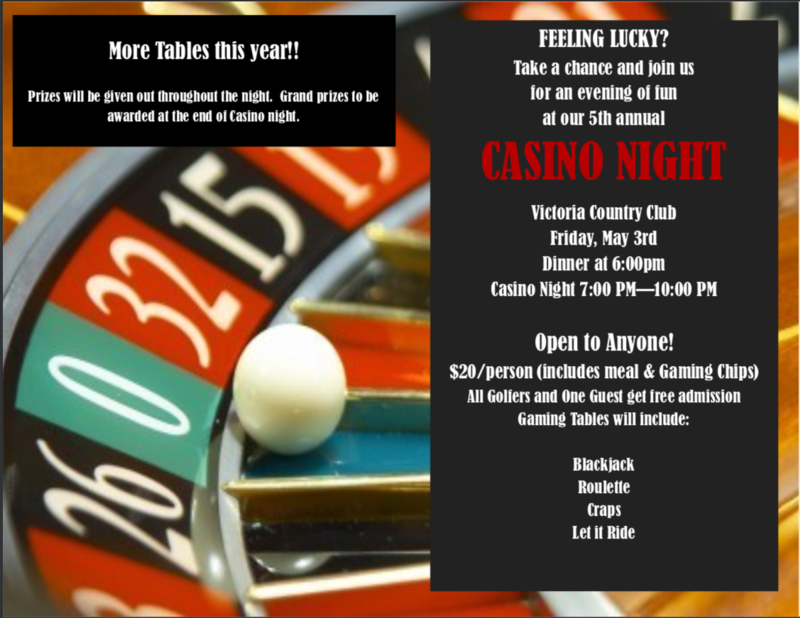 The Victoria Chapter of the American Petroleum Institute is pleased to announce that the 60th Annual Golf Tournament will be held at Victoria Country Club on May 3rd and 4th 2019. This golf tournament is one of our biggest fundraisers for SCHOLARSHIPS. We have many ways for you to actively participate in this year's tournament as either a Golfer or Sponsor. A 4-Man Scramble will take place at Victoria Country Club on Friday, May 3rd, with both 8 AM and 1 PM shotgun starts. Cost is $125.00 per person or $500.00 per team. Platinum and Gold level sponsors receive four positions in the Friday Scramble. Format is 4-Man scramble with a team getting 10% of total team handicap (Max team handicap is 120). Each player will hit from the tee box. The team will then select the most favorable shot and play their next shot from this new position. Play will continue in this manner until the ball is holed. A 2-Man Tournament will be held on Saturday only. Your entry fee of $100.00 per man will include green fees for Saturday, one mulligan each day, golf carts, and entry into Casino Night. The format for this year's tournament will be a two man scramble. Each Team will be flighted after the round is complete. If you have any questions about the format of play, please contact: Shad Hardin (361) 573-0134. The Tournament will be limited to the First 256 Paid entries. Along with your Tournament Application, please send in a clean business card or company letterhead for the program. On behalf of the Victoria API, we thank you in advance for your active and continued support of the fundraiser for SCHOLARSHIPS. We appreciate each and every one of our Sponsors and Golfers that help make this tournament a truly special event. This golf tournament is one of our biggest fundraisers for SCHOLARSHIPS. We have many ways for you to actively participate in this year's tournament as either a Golfer or Sponsor. $125.00 per person or $500.00 per team.